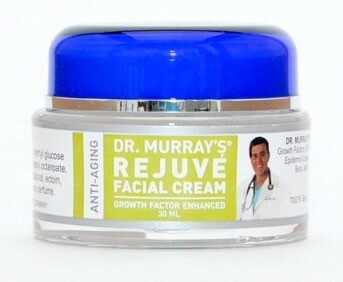 Dr. Murray's patients love Rejuvé Facial Cream™ because it delivers noticeable skin rejuvenation results. The extra growth factors in Rejuvé boost skin damage and aging repair. 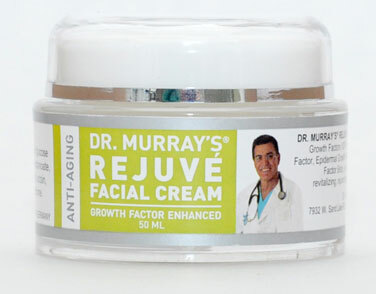 It has 100% more growth factors than plain colostrum body cream. The ectoin in our ingredient works to repair UV light damage. The nine growth factors in Rejuve work over time to improve the look and feel of your skin, delivering the skin repair results that most over the counter face creams only promise." Seeing is believing - try our Rejuvé Facial Cream™ 50ml facial cream and see how it works for you! Dr. Murray's 100% money-back, no questions asked guarantee ensures you'll get the results you want or your money back. 22 points will be rewarded to you when you buy this item. Sign into your account to view or redeem your points. When you're signed in, you'll be able to redeem your points on eligible products!